Harvard Stem Cell Institute researchers at Boston Children's Hospital have new evidence in mice that it may be possible to repair a chronically diseased liver by forcing mature liver cells to revert back to a stem cell-like state. The researchers, led by Fernando Camargo, PhD, arumbled upon this discovery while investigating whether a biochemical cascade called Hippo, which controls how big the liver grows, also affects cell fate. The unexpected answer, appearing in the journal Cell, is that switching off the Hippo-signaling pathway in mature liver cells generates very high rates of dedifferentiation. This means the cells turn back the clock to become stem-cell like again, thus allowing them to give rise to functional progenitor cells that can regenerate a diseased liver. "I think this study highlights the tremendous plasticity of mature liver cells. It's not that you have a very small population of cells that can be recruited to an injury; almost 80 percent of hepatocytes [liver cells] can undergo this cell fate change." said Camargo, who is an associate professor in the Harvard Department of Stem Cell and Regenerative Biology, and based in the Stem Cell Program at Boston Children's Hospital. When the Hippo pathway is inactivated, mature liver cells revert back to a stem cell-like nature. 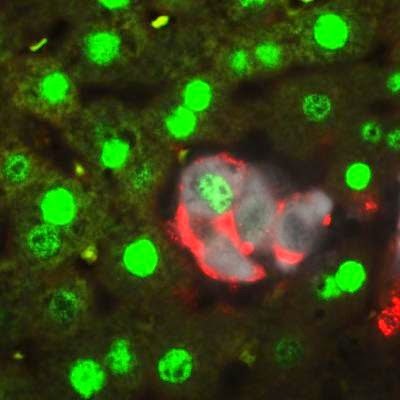 The image shows a group of cells transitioning from a mature cell type (green) to a stem cell type (red). White cells are the cells where Hippo is being inactivated. It might also be possible to control Hippo signaling to grow countless liver progenitor cells in a laboratory dish for transplant, which Camargo's team pursued in the Cellpaper using mice born with a genetic liver disease. They cultured healthy liver progenitor cells and transplanted them into the diseased mice. Over a period of three or four months, the transplanted liver cells engrafted and the animals saw improvement of their condition. "People have been trying to use liver cell transplants for metabolic diseases since the early 90s, but because of the source of cells -- discarded livers -- they were unsuccessful. With this unlimited source of cells from a patient, we think that perhaps it's time to think again about doing hepatocyte or progenitor cell transplants in the context of liver genetic disorders." Camargo said. 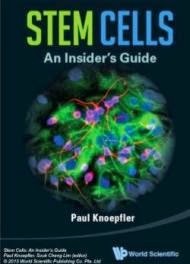 "I think that maybe it is something that people have overlooked because the field has been so stem cell centric. But I think the bottom line is that the cells that we have in our body are plastic, and understanding pathways that underlie that plasticity could be another way of potentially manipulating regeneration or expanding some kind of cell type for regenerative medicine." 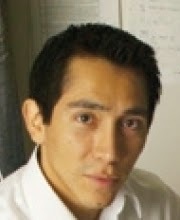 said Camargo, also a Harvard Stem Cell Institute Principal Faculty member. The research was supported by the Harvard Stem Cell Institute, the Stand Up to Cancer-AACR Initiative, the National Institutes of Health, and the Department of Defense.